> Which is the most googled brand in the world? Which is the most googled brand in the world? Quickco, an online british car parts store, has managed to compile the results of the most googled brand in the world. Although Toyota is no longer world’s biggest automaker by sales, Google search results reveal that it is by far the most searched car brand in the world. The Japanese brand is the most searched brand in countries including the United States, China and Australia. In fact, it tops the list in 74 countries last year. Second position goes to BMW where it topped the charts for 51 countries. Most of these countries belong in Europe naturally. 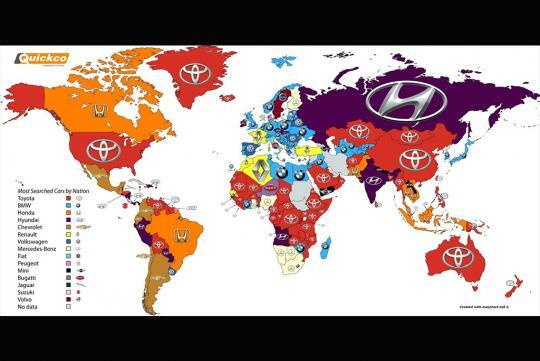 Proving surprisingly popular in Russia and India is Hyundai, which is the third most searched brand in the world. Meanwhile in Singapore, Toyota remains the most searched brand while the rest of the Southeast asia wants to know more about Honda instead. Which is the most googled car manufacturer? China does not have Google. so this result for China must be inaccurate.